Cierra Garrow is a 22-year-old mental health advocate working as an IBI Therapist and a Community Based Psychiatric Rights Adviser in Northwestern Ontario. She recently completed a Bachelor of Psychology and Indigenous Learning from Lakehead University with First Class Standing. 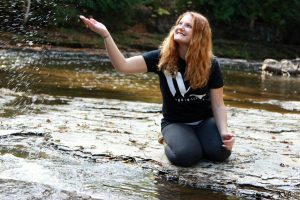 Due to Cierra’s struggles with borderline personality disorder, generalized anxiety disorder, dysthymia, and suicide, she has decided to pursue her passion of bringing mental health resources and services to the North. Currently, Cierra is pursuing a Master’s of Arts in Counselling Psychology with a specialization in Psychometric Testing and concentration in Crisis / Trauma Counselling. Growing up in Northwestern Ontario, mental health resources were scarce. At age six, I was diagnosed with a mental illness. I struggled with staying still, paying attention, and completing tasks. These impairments followed me from elementary school, to high school, and then to University. I attempted suicide for the first time in Grade 8. My relationship with my peers was volatile and consisted of hostility. The stigma around mental illness and taking medication was incapacitating. I was physically assaulted and the subject of ridicule from both my peers and my principal for being ‘sick’. I started self-harming to cope with everyday life. I felt like I was failing at every single aspect of my life. Following the suicide attempt, I was waitlisted for counselling. In high school, my grades continued to plummet. I started missing more classes than I attended. Most days were spent in bed; I would wake up, sometimes eat, maybe shower, go back to bed and repeat. Leaving the house became an impossible task because of debilitating anxiety that consumed me. I attempted suicide again in Grades 9 and 11. Only then did my team of doctors, nurse practitioners, school counsellor, and family advocate for my admission to an inpatient Youth Psychiatric ward for treatment. It took four years for me to gain access to the help I needed to begin recovery. I started to regain my zest for life and completely restructured my lifestyle. I no longer spent each day counting down the seconds until I could collapse back into my bed. I decided than I wanted to be the change in my community. By having access to the appropriate resources such as counselling and medication saved my life. I would make it my life mission to ensure that no child had to reach their breaking point before receiving the help they needed. I became a passionate, driven and an engaged student and community member. I finished Grades 11 and 12 with a 90 plus average and was accepted into Lakehead University. I participated in mental health advocacy by sharing my story at the local schools. I shared it with the local newspapers and on the radio. I became the ambassador for Clara Hughes Big Ride and Bell Let’s Talk for my community. I became the ambassador for Ride Don’t Hide and continue to work towards destigmatizing medication, suicide, and mental illness. I am also an ambassador for Worth Living and feel my story and give people hope. Recovery is an ongoing process and I am actively participating in Dialectical Behaviour Therapy to this day. My mental illness will always be a part of me, but it no longer controls my life. I am now a post-secondary graduate and completed two undergraduate degrees in three years’ time. I have maintained being on the Faculty of Health and Behavioural Sciences Dean’s List and have achieved at the top 10-5% of psychology students in my university. I am thriving and have established a foundation of wellness. I am now healthy and prepared to be the change in my community. I plan to practice inter-professional networking and connect with the schools, hospitals, and local organizations to provide the best care possible. By obtaining a Masters in Counseling Psychology from Yorkville University, it will allow me the best platform to achieve success and provide the quality care that my community needs and deserves. Yorkville University has allowed me to return home and continue to nourish and sustain my community. I will gain the skills, insight, and knowledge I need to be an exemplary mental health counsellor. I have recently been hired on as an IBI Therapist and a Community Based Psychiatrics Right Adviser, which allow me to make change in my community. Do you know who you are? Do you know why you’re here? Do you know how you got here? There are few things worse than being unable to feel… Feeling like you’re completely and utterly alone is one of them. Isolated in your crumbling pain, a chaos of fuzzy emotions and unfathomable hurt. A fist clenched around your gut, twisting and turning. A paralyzing fear that cripples you into a heaping mess of too lates and overambitious dreams. I was supposed to be successful. Watching the lives of others flash by on a screen as the encoded messages tell me what I’m missing. The pictures of smiles and laughter, friends and drinks, husbands and children fill my newsfeed. But where am I? I sit here looking at an empty reflection. Trapped behinds a flood of tears and hopeless attempts to be more than nothing. A desperate plea to amount to some worth that exceeds the dirt on the floor. How did I get here? The worlds spinning a screaming mess of anxiety and pressure. The lids about to explode. And yet, there is stillness. A frozen impairment of functionality and loss of grip with reality. A dissociation of identity that splits me apart from the shreds of humanity I desperately attempt to hold. Why am I here? What purpose does my existence have on the people around me. My fading in and out of lives while I dance around the relationships I could have had. Did I put myself here? How did I get here. A broken repercussion of high expectations and too many sleepless nights of unachievable perfection. The body I have been given feels sick and weak, everything radiates pain. The muscles feel as if they are untethering from the bone, yet they cling to the fabrics of my being. It hurts. It hurts to be alive. It hurts to be alone. It hurts to be with people. It hurts to feel. This invisible barrier that separates me from connectedness. Like an animal in a zoo, staring at the happy families, giggling children and infatuated lovers. Segregated away from society… Perhaps it is better this way. A blessing in disguise meant to save me from myself. At least here maybe I serve a purpose. An example of what sickness looks like. A girl whose dreams amounted to no more than the empty hands she owns. What purpose is there to exist? What use is there to feel this much pain. To barely feel as if i’m living. A zombie who catatonically goes through the motions of existence. Wake up, eat, sleep, repeat. Repeat. Repeat. Repeat. How many times does the broken record play, always skipping between a D flat and a C sharp. I feel too much, but I feel nothing at all. So I sit here, alone. I have people around me, people who care but their worry and concerns flutter off my skin. The pit of my stomach churn and tears swell in my eyes. Why does it hurt. My acne ladden face filled with poison, a pity to look at really. Disgusting, a revolting circus act that is gawked at for the entertainment of the wicked. A dance for the devil, playing of flames licking the flats of my feet. It hurts. It hurts to be mentally ill. It hurts to be alive.